We visited Club Med in Ixtapa, Mexico the last week of February 2009. We had a great visit! The place and the people are fantastic. The notice about the Tourist Card from the US Government can be ignored. "U.S. citizens traveling as tourists beyond the border zone or entering Mexico by air must pay a fee to obtain a tourist card, also known as an FM-T, available from Mexican consulates, Mexican border crossing points, Mexican tourism offices, airports within the border zone and most airlines serving Mexico. The fee for the tourist card is generally included in the price of a plane ticket for travelers arriving by air." This is all handled in a manner that's transparent to you. You do need a valid passport to visit this part of Mexico. The State Department has some warnings that some countries might not let you in if your passport expires in less than six months. Our passports will expire one and two months after our trip to Mexico. That presented no problems. When you enter Mexico, you'll fill out an immigration form for each person. Retain it with your passport to present when you leave Mexico. If you lose the form, it will cost around $50 US to replace it. I've heard that losing this form is worse than losing your passport. Runway 26 is the westbound runway at Zihuatenejo. We landed and took off in that direction. We had no problems with customs or immigration at either end. All officials were quite nice and helpful. At the Mexican customs, each party presses a button. If it causes a green light to come on, you go right through. If you get a red light, you get your luggage inspected. We got a green light and it seems most people do get a green light. There can be some great deals going to Club Med. Check the website. Try various dates and points of embarkation. During late February, it seems that the best deals were flying out of San Francisco (SFO) and Los Angeles (LAX). It could pay to get yourself to SFO or LAX and book Club Med from there. See www.clubmed.com. You're going to "Club Med." It happens to be in Mexico. You're not "going to Mexico and staying at Club Med." Most folks just stay at the resort -- nothing wrong with that, but you won't get to "know Mexico." This resort is in the Mexican state of Guerrero. The best week to go each month would be the one where the moon goes from new to full. We were there on a waning moon (visible in the morning hours), so we didn't see it. The Club Med site highlights the wonderful temperatures. Check the humidity, too. That's the key. We hear that July suffers from overly high humidity. February was sticky for those of us from California, but probably not too bad for those used to a humid summer. At the airport, you'll be met by the bus and G.O.s who load your luggage. Your room keys will be issued on the bus. They'll have bottled water for you, too. Note how the schematic map (left) differs from the more realistic map (right). The Pajaro building really pulls away from the beach as in the right map, and there is an access road in and out! Your wrist band will be put on while you're on the bus. The wrist band is your "pass" to the resort and to the bars during your stay. You'll be greeted with a nice, cool scented towel and greetings from the Chief of the Village. A G.O. will take you to your room and give you a tour of the resort. Your luggage will be taken to your room. It'll be left outside the door, which was surprising to us, but not a problem. The front desk G.O.s say they don't have information or a map about what's nearby. You have to get that yourself. The luggage tags we were provided fall out. We even found ones loose around the resort. Attach them to your luggage and then tape both sides. 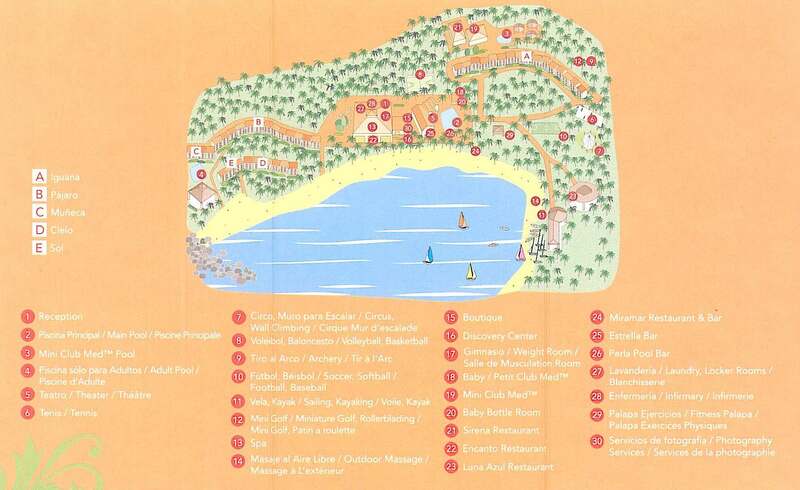 Club Med is on Playa (Beach) Quieta. The resort "owns" virtually the whole beach. The pools and the beach are great! The great folks who help you during your stay are known as G.O.s (gracious organizers). The local hired help are called G.E.s (gracious employees) and you'll be known as a G.M. (gracious member). Sometimes "gracious" is "gentle." You'll hear "G.O." most often. On G.O. shirts, it says "G.O" with the second period missing. I haven't been able to find a reason for this construction. Saturdays are the busiest days for G.O.s because that's leaving and arrival day for most guests. G.O.s generally work one year at a resort, then move to a different resort. That's disappointing to returning children! The head of the resort is known as the "Chief of the Village." Jean-Marc is the Chief, but Vladimir was our temporary Chief during our visit. He's a great guy, admired by the G.O.s and certainly by the G.M.s. "Crazy Signs" are a group of songs with associated steps and hand movements. They'll be performed at most evening events. Apparently, Crazy Signs were a bigger component of the old Club Med experience. Crazy Signs only showed up on our events schedule once during the week and we didn't know what that meant. "Hands Up" is considered the quintessential Crazy Sign. The daily schedules are available each day at registration and at the restaurant. They're available in three languages. For sample January schedules and February schedules, download the pdf's. The dress code notes on the schedules are really aimed at the G.O.s, not the public. You can spend your entire stay in swimsuits, shorts, cover-ups and tennis shoes. Some folks do like to and do dress up for dinner, especially at Luna Azul and the Miramar, but you don't have to. Dress seems to get more casual as the week goes on. Bring lots of shorts and shirts that can be rinsed out, air dried and worn again. Some of those high-performance fabrics are really good. One evening a group of local craftspeople set up tables offering Mexican items for sale. On another evening, two G.O.s write your name in "Mayan." It's a version of Mayan where one pictograph is used for each letter. The G.O.s are fun to talk with and they are eager to practice their English. They'll tell you a few Mayan legends, too.